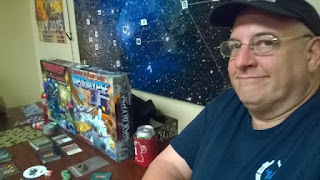 I had a chance to play Conquest of Planet Earth: The Space Alien Game (2010) with the Conquest of Planet Earth: Apocalypse (2012) expansion the other day. We played a game with four people and then a couple more with three. It's a good looking game with a nifty theme and fun artwork and components. Note: The summary is a little out of date, the game contains 16 alien saucers and 4 allied models. They are however all detailed and of a high quality. Conquest of Planet Earth: Apocalypse, an expansion for ''Conquest of Planet Earth: The Space Alien Game'', includes new alien races (one of them being the Martian Confederation from FFP's ''Invasion from Outer Space''), new allies to help those invaders, and new cards for all other decks in the base game. The expansion includes a new "Coastal Resistance Deck" that boosts Earth's defense forces with naval ships, submarines, and jet fighters. Additional components allow for two additional players to join in, raising the maximum player count to six. I'm of two minds on this game but could go either way: one being to write it off as not worth playing and the other to adjusting it with a few house rules to remove huge "swinginess" due to luck. It has a few flaws that I think are hugely problematic. It is meant to be a fast paced game but throws a lot of math at the players at the beginning of combat while simultaneous requiring all players to be aware of the cards they have available too them during every combat. For some players, this isn't a problem. For players that have analysis paralysis, this will bog down every single combat which can happen one or more time during each player's turn. 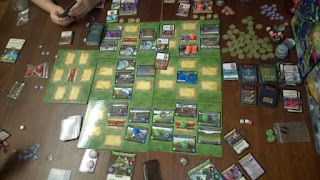 The randomized locations deck means some player might draw very little they can utilize to gain victory points close to their landing zone while it is possible to draw as few as two location right next to the landing zone that allows victory on turn one, possibly before anyone else has even had a turn to play. If opponents have no applicable cards to stop that player, which is a very real possibility, they simply move their aliens on turn one, roll a few combat dice (and play a card or two), and the game is over. Furthermore, mitigating this luck is incredibly difficult due to the short nature of the game. With only 8 victory points needed to win, which can be done on one or two turns, there is little time to implement a strategy that offsets the luck of drawing certain cards or rolling a few well-timed sixes. Since a six always wins a combat, regardless of the strength of the alien force or resistance, a combat could be 1d6 plus zero versus 1d6 plus 20 and still go either way when a six is rolled by one side or the other and considered an overwhelming victory. If I were to get talked into playing this again I would want several house rules in play. I would want the required victory point total for a win to be 20 rather than 8 to ensure some direct player interaction and a chance to mitigate the rampant luck inherent in this game. I would want no more than half a player's victory points to be able to come from their landing area board. I would also want for combat to not require a roll if one side or the other had six more pluses than their opponent. I might also like to see the auto-win on a six be removed but with the previous house rule this might not be as much of a problem. I have no idea if the problems baked into this game were by design or despite it but they make for a game that is heavily based on luck. I suspect the latter since I cannot imagine a game design that is aware that a game can end before one or more players have even had a turn. That definitely seems like an oversight which in turn suggests some of the other problems slipped through unnoticed as well.